Thank you, thank you, thank YOU! Your amazing generosity has helped us reach our goal of £35,000! Help us go one better and reach our ambitious stretch target of £50,000. This would be a massive boost to our campaign, and would allow us to propel the movement for Proportional Representation to even greater heights. Go on… you know you want to! Make Votes Matter is the cross-party movement for Proportional Representation in the House of Commons. Formed by frustrated voters after the most disproportionate general election in British history in 2015, we’ve made a huge impact on a tiny budget. British politics is falling apart at the seams - and so much of the blame rests with our broken First Past the Post voting system. While Parliament doesn’t reflect the people, while millions are excluded from representation, and while some votes are worth many times more than others, we cannot call ourselves a real democracy - and what primitive democracy we do have cannot solve the problems our society faces. That’s why we exist with the sole purpose of winning Proportional Representation in the UK, and we’re determined to do so in years, not decades. We’re convening all the parties, organisations and public figures who want fair votes to work together in the Make Votes Matter Alliance. We’re working to make sure one of the two largest parties - the Labour Party - finally commits to Proportional Representation. And we’re growing the grassroots movement to carry the people’s demands for real democracy to every community, journalist and politician. First Past the Post stifles diversity in Parliament, but there is now so much political diversity in the UK that it has become a powerful force for winning fair votes. Over the last year, we’ve brought together the rapidly growing MVM Alliance of parties, campaign groups and public figures for quarterly meetings in Parliament, coordinating efforts to campaign for fair votes as a united front. As well as taking action to bring down First Past the Post, the Alliance is building cross-party consensus about the kind of elections we need. The Alliance has agreed the common principles of good, proportional voting systems, and is now discussing how a citizen-led process could select a new system for the UK. We’ve shown that by working together the Alliance can use its diverse voices and combined clout to shape the narrative about electoral reform. 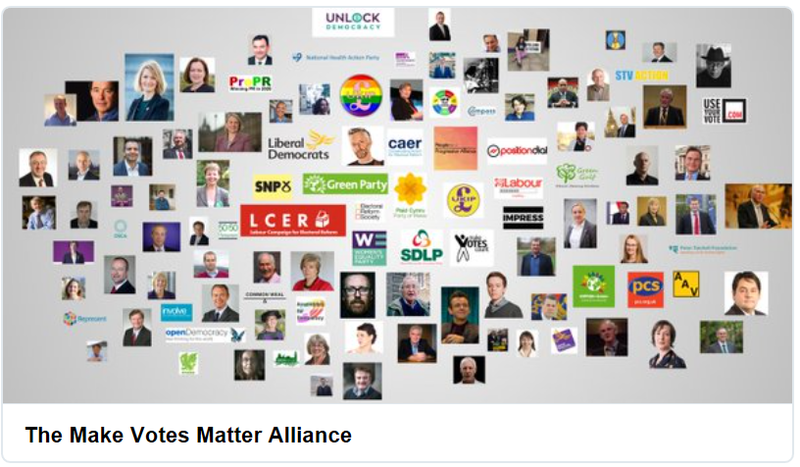 Next, we need to develop the Alliance as a bona fide campaigning force, mobilise the supporters and followers of all Allies to act as one when it comes to the single issue of PR, and bring new voices into the Alliance representing the broadest possible cross-section of British society. To win PR, we need the support of one of the two biggest parties: namely, the Labour Party. Most Labour members understand that First Past the Post is not only undemocratic, but makes a mockery of Labour’s claim to be a party “for the many”. 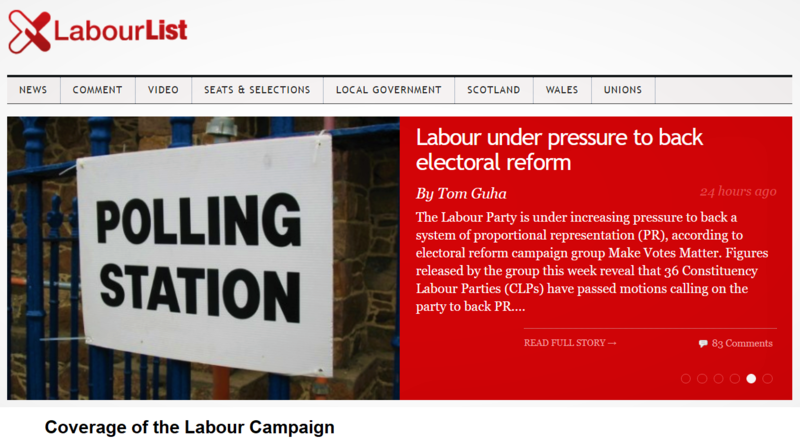 We’ve been working with the Labour Campaign for Electoral Reform to mobilise this support into action. We’ve now provided expert speakers to almost 100 local branches - the fundamental units of the Labour Party. As a result, 36 local parties have already passed motions calling on Labour to back PR - accounting for well over 5% of Labour branches in Great Britain. At the same time, we’re building support within the Parliamentary Labour Party and among trade unions. Your donation will help us provide speakers to hundreds more branches, building calls for change to the point at which they cannot be ignored. It will help us reach more MPs and bring together figures from across the Labour movement to share evidence and change minds. If we can trigger an open and democratic review of party policy toward electoral reform, it will only have one outcome: support for Proportional Representation. Advances in democracy don’t happen until a critical mass of people are determined and organised enough to create an unstoppable movement. Just look at votes for women, the civil rights movement, or other countries that have thrown off First Past the Post. Thanks to the work of activists, volunteers and local groups we’ve made fantastic progress mobilising bigger and bigger actions to demonstrate widespread support, build public understanding, and persuade political figures to support and actively campaign for PR. This ranges from our MP lobbying campaign, to our summer action day - the biggest mobilisation for PR in living memory - to a 24 hour fast for fair votes in which hundreds participated. With your help we can grow this network of activists and then strengthen the support they rely on. We can plan coordinated actions for electoral reform the size of which has never been seen before. And later this year we will hold a big lobby day at Parliament to demand the biggest advance to our democracy since women won the vote. We are aiming to raise £35,000 to help us win PR. As a volunteer-based campaign on a budget, we place huge value on every pound we receive. Our full-time team, who have left various careers to do what is necessary to win fair votes, are paid the Living Wage so we can make our funding go as far as possible. This year alone we have had great success putting PR firmly in the spotlight. To continue our work, we need your support. 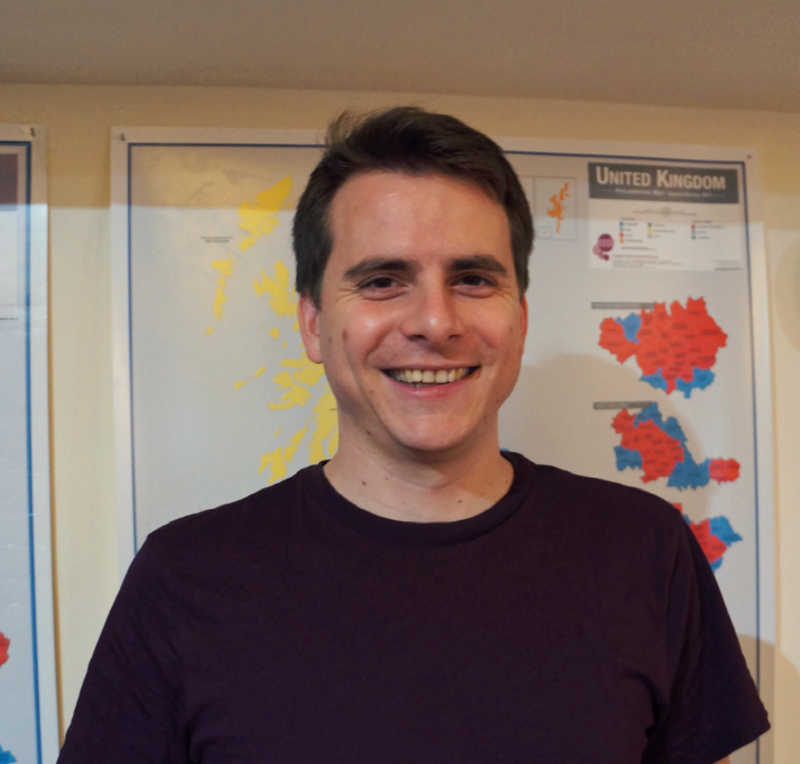 Please give what you can to help us win real democracy in the UK! Join the movement to receive updates about the campaign. 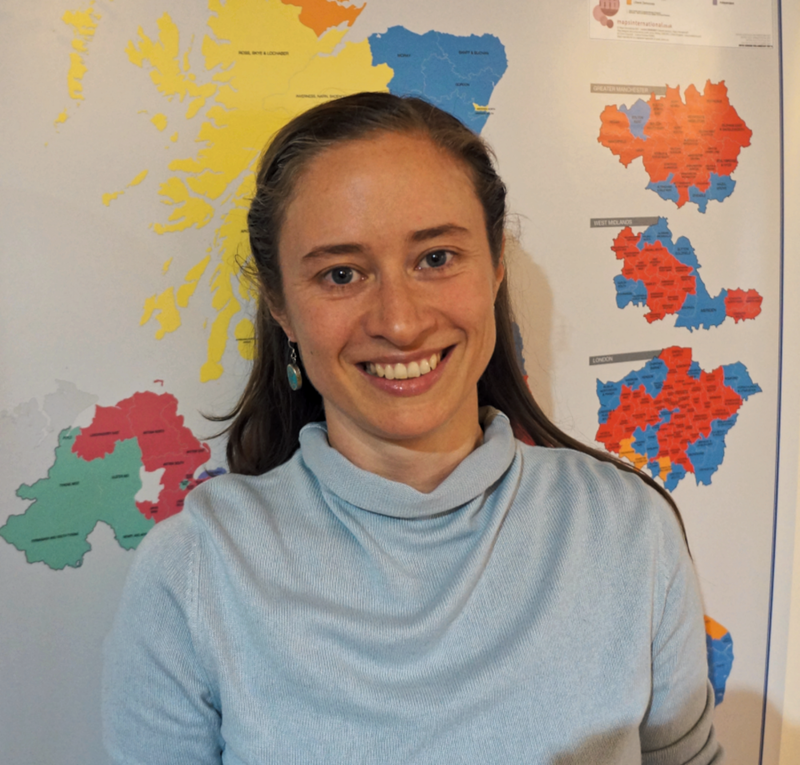 Lobby your MP - let us put you in touch with other constituents so you can meet your MP and make the case for electoral reform as a group. Find and join your local campaign group, or let us help you start your own. Volunteer your time, skills and enthusiasm to help run the national campaign. If you're a member of the Labour Party, invite an expert speaker on PR to your CLP or branch. Like and follow us on Social Media. Facebook, Twitter, LinkedIn, Instagram. A warm feeling inside - you’re helping us win real democracy. Receive one of the first ever Make Votes Matter pens and handwritten Thank You from MVM HQ. A limited edition Representation of the People Act Centenary year mug with a handwritten Thank You from MVM HQ. A black cotton tote bag with a big Make Votes Matter logo to get the message out without saying a word. Let the Make Votes Matter T-shirt do the talking - and get a handwritten Thank You from MVM HQ. A cotton tote bag, badge, hat, pen and handwritten Thank You from MVM HQ. A meet and greet with the team behind Make Votes Matter at our Bristol HQ - pop by for a cuppa / glass of something stronger and get the inside scoop about why we're sure we can win PR! Key Sponsor status: your name/logo on the Key Sponsors page of the Make Votes Matter website. Key sponsor status and a VIP invite to the Democracy Awards in December. Key sponsor status, a VIP invitation to the MVM Democracy Awards in December alongside an award being made in your name and honour.